Before The Beatles, before Elvis Presley, there was Nat King Cole. Both with the King Cole Trio and as a solo artist he would be phenomenally successful. From 1942 to 1964 he would have scores of hit singles, many of which would reach no. 1 on the various Billboard charts. As a solo artist he had 14 number one hit singles in Britain alone. So successful was Nat King Cole that the Capitol Records Building, completed in 1956, is still known as "the House That Nat Built." Few other performers ever saw the success that Nat King Cole had. He was born 100 years ago today, March 17 1919, in Montgomery, Alabama. 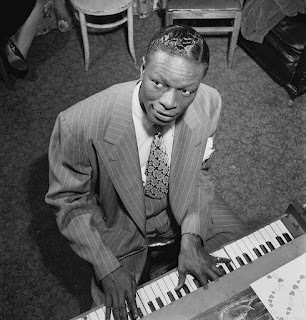 Nat King Cole was born Nathaniel Adams Coles. Like his brothers, Eddie, Ike, and Freddie, he took to music while young. His mother taught him to play organ. When he was 12 he began learning how to play the piano formally. With his brother Eddie, who was a bassist, he formed Eddie Cole's Swingsters. Eddie Cole's Swingsters recorded two singles for Decca in 1936. He played in a revival of the musical Shuffle Along. Afterwards Nat King Cole led a big band and then formed the King Cole Swingsters with bassist Wesley Prince and guitarist Oscar Moore. They soon changed their name to the King Cole Trio. In 1940 they recorded the single "Sweet Lorraine". In 1941 the King Cole Trio recorded "That Ain't Right" for Decca, which would prove to be their first big hit. It went to number one on the Billboard R&B chart. The King Cole Trio proved very successful. They appeared frequently on radio, with several guest appearances on Kraft Music Hall (starring Bing Crosby) in particular. In 1946 they had their own 15 minute radio show, King Cole Trio Time. They appeared in the feature films Stars on Parade (1944), Swing in the Saddle (1944), Killer Diller (1948), and Make Believe Ballroom (1949), as well as several short subjects. In 1947 Nat King Cole recorded "Nature Boy" with an orchestra, and the single was credited to "King Cole". The song hit number one on the Billboard singles chart. With various departures from the King Cole Trio and some success as a solo artist, starting in 1949 singles were being credited as "Nat King Cole & the Trio". Starting in 1950, the singles credited to "Nat King Cole". It was in the spring of 1951 that it was announced that the King Cole Trio had been dissolved. If anything, Nat King Cole became even more successful as a solo artist. Indeed, even in years when he did not have a number one record (such as 1953, 1954, and 1955), his singles still did so well that he would still rank in the top ten most successful music artists for the year. With such success, it should come as no surprise that Nat King Cole would make the move to television. In 1956 Nat King Cole signed a contract with CBS to host a show of his own. Unfortunately plans for a show starring Nat King Cole never moved forward at CBS. It was later in the year that Nat King Cole signed a contract with NBC. This time around a show did emerge. The Nat King Cole Show debuted as a 15 minute programme on Monday night, November 5 1956 at 7:30 Eastern/6:30 Central. While The Nat King Cole Show was definitely a major milestone for black performers on television, contrary to popular belief, it was not the first variety show to be hosted by a black person. In 1950 singer Hazel Scott hosted the short-lived Hazel Scott Show on the ill-fated Dumont Television Network. In 1952 singer Billy Daniels hosted the short lived Billy Daniels Show on ABC. Since Hazel Scott was from Trinidad, Billy Daniels was then the first African American to host a variety show. That having been said, The Nat King Cole Show was the first time that a variety show was hosted by an African American with the success of Nat King Cole. In fact, Nat King Cole was more successful than many of the white singers who hosted variety shows. Despite Nat King Cole's phenomenal success as a recording artist, The Nat King Cole Show would prove to be ill-fated. NBC had agreed to finance the show in the hope that a national sponsor would pick it up. Sadly NBC found had problems finding national sponsors for the show. Many advertisers were afraid of the reaction that the South might have if a company sponsored a show hosted by a black man. Someone representing the cosmetics company Max Factor even insisted that an African American could not sell lipstick for them. Carter Products (who manufactured Carter's Little Liver Pills and Arrid deodorant) bought time on The Nat King Cole Show from time to time, but it was not enough to support the show. To help support the show NBC sought out local sponsors, so that Coca-Cola sponsored the show in Houston, Rheingold Beer sponsored the show in New York City, and so on. Amazingly enough given Nat King Cole's success as a musical artist, The Nat King Cole Show also suffered from low ratings. In an attempt to improve the ratings, NBC revamped the show in July 1957, expanding it to half an hour and giving it a bigger budget. In an effort to save the show, Nat King Cole's fellow performers worked for industry scale or even nothing at all. Such big names as earl Bailey, Harry Belafonte, Tony Bennett, Sammy Davis, Jr., Ella Fitzgerald, Frankie Laine, Peggy Lee, Eartha Kitt, and Mel Tormé all appeared on the show. Unfortunately, none of this was enough to attract a national sponsor for The Nat King Cole Show or dramatically improve the ratings. Unwilling to give up on the show entirely, NBC offered to move The Nat King Cole Show to 7:30 PM Eastern/6:30 PM Central on Saturdays. Nat King Cole declined the network's offer of a new time slot and decided to end the show. The Nat King Cole Show ended its run on December 17 1957. Nat King Cole credited with NBC, from David Sarnoff on down, with having supported the show from the beginning right through to the very end. He blamed the show's failure on sponsors and advertising agencies afraid of supporting a show hosted by an African American. While The Nat King Cole Show proved to be ill fated, he continued to guest star on such programmes as The Dinah Shore Chevy Show, The Perry Como Show, The Garry Moore Show, and yet others. He also had a career in movies. Having already appeared in films as a vocalist, Nat King Cole appeared in the role of Danny Rice in the film Istanbul (1957). He was one of the leads in the film China Gate (1957). He played the lead role of W. C. Handy in the biopic St. Louis Blues (1958). He played a supporting role in Night of the Quarter Moon (1960). Nat King Cole's last appearance in a feature film would be in the Western comedy Cat Ballou in 1965. He played the Sunrise Kid, who with Sam the Shade (played by Stubby Kaye) serve as a bit of a Greek chorus in the film. Sadly, Nat King Cole died only four months before Cat Ballou was released. It was in 1964 that Nat King Cole, who had been a heavy smoker his entire life, was diagnosed with lung cancer. His condition worsened and it was clear that his illness was terminal, although the press at the time gave no real indication of how serious his cancer was. It was on February 15 1965, the day after his 45th birthday, that Nat King Cole died. Nat King Cole would leave behind an incredible legacy. With the King Cole Trio he would prove to have a lasting influence on jazz, particularly with regards to jazz piano. The trio itself would provide the template for many small jazz ensembles to come, consisting of piano, guitar, and bass. Much of the King Cole Trio's work would even have a lasting impact on rock and roll. Such singles as "Straighten Up and Fly Right" can easily be considered forerunners of rock and roll. To a degree Nat King Cole was a controversial figure. African American activists were not happy that he performed before segregated audiences. As a popular black artist, he also attracted the ire of racists and was even attacked on stage in Birmingham, Alabama by white men. Eventually Nat King Cole agreed to boycott venues that practised segregation. While Nat King Cole had played before segregated audience, he also contributed money to the Montgomery Bus Boycott and sued hotels that refused to serve him. He later played an important role in the planning of the the March on Washington in 1963. As a solo artist Nat King Cole shifted from being a jazz pianist to a crooner, but he would still have enormous success and an incredible impact on music. Indeed, he ranks alongside the most successful crooners of all time, including Bing Crosby, Frank Sinatra, and Dean Martin. As a singer Nat King Cole was gifted with a rich baritone and perfect pitch. This is all the more remarkable given that, as a vocalist, he had no formal training. Nat King Cole would have a lasting influence on future vocalists, including Sam Cooke, Al Jarreau, Johnny Mathis, and yet others. Both as part of the King Cole Trio and as a solo artist, Nat King Cole played a pivotal role as one of the earliest black music artists to gain popularity with white audiences. To this day Nat King Cole remains one of the most popular vocalists of all time. Compilation albums of his songs have been released right up to this very day, and episodes of The Nat King Cole Show are available on DVD. Few other music artists would ever see the success of Nat King Cole. He remains not only one of the most successful performers of the 20th Century, but perhaps of all time. The first year of our marriage we purchased a CD player and a huge set of Nat "King" Cole CDs to enjoy. As the hubby said "Even when I was a Beatles loving teenager I knew that Nat was a "real" singer." I remember about 50 years ago, I was at a friend's house and his dad had a Nat King Cole album. It was a picture of Cole with a super imposed crown on his head or somewhere on the album. We were laughing at the corniness of it and my friend's father mentioned something to the effect that he was ten times better than the Beatles or "whoever it is you guys listen to these days." Little did I know that I now would have all of his songs on my iTunes collection and, gasp, none from the Beatles.